When you have sensitive skin, you often start forming a checklist of what you want in your skin care products. Dove Dry Spray Antiperspirant Deodorant Unscented checks all the boxes and comes with the added benefit of spraying on instantly dry so you can get dressed right away. As well as being kind to your skin and clothes, this dry spray antiperspirant deodorant gives you effective 48 hour protection so you will feel clean and dry all day long. 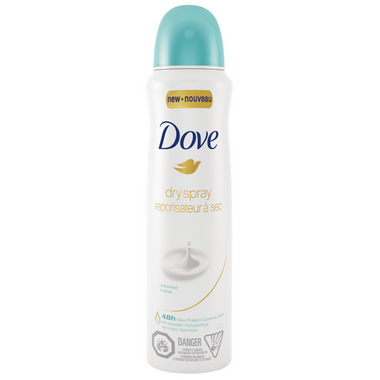 This Dove Dry Spray Antiperspirant Deodorant Unscented is also great if you’re prone to a spot of dryness. This ¼ moisturizing cream and dermatologist tested formula helps to condition your underarm skin, helping it to recover from the dryness caused by shaving. With regular use, you will notice your underarm skin looks and feels beautifully soft and smooth. So, now you can put down the checklist and relax. Choose this antiperspirant and get a clean, fresh feeling that is caring to skin. At Dove, Thier vision is of a world where beauty is a source of confidence, and not anxiety. So, They are on a mission to help the next generation of women develop a positive relationship with the way they look – helping them raise their self-esteem and realize their full potential. Ingredients: Butane, Cyclopentasiloxane, Hydrofluorocarbon 152a, Isobutane, Aluminum Chlorohydrate, PPG-14 Butyl Ether, Helianthus Annuus (Sunflower) Seed Oil, Disteardimonium Hectorite, C12-15 Alkyl Benzoate, Propane, BHT, Parfum, Octyldodecanol, Propylene Carbonate, Dimethiconol, Tocopheryl Acetate. This is my favourite deodorant ever! I like that it isn't totally unscented - it does have a hint of scent, very light and clean and fresh. perspiration and odor protection. 5/5 AWESOME ! This products says unscented, but does have a masking fragrance and the ingredients do state fragrance. I get headaches from perfumes and synthetic fragrances and I tried it once and had to give it away because it really bothered me. Their stick deodorant is truly unscented which is why I love it. If you are looking for a light neutral fragrance this would probably work for you.